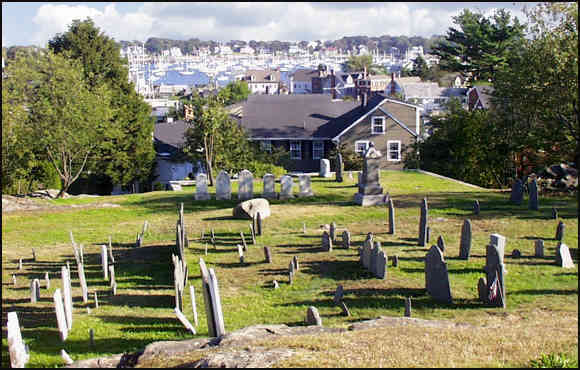 Old Burial Hill is one of the most picturesque graveyards in New England. It affords a view of Old Marblehead, the harbor, and the sea. 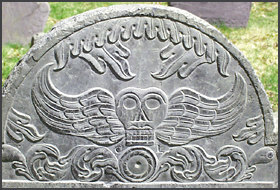 Established in 1638 at the site of Marblehead’s first meeting house, it's the burial site of an estimated 600 Revolutionary soldiers, although only a few of those graves are marked. 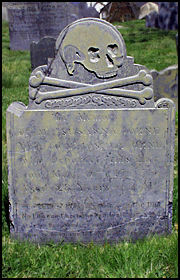 The graveyard has many well preserved headstones, some dating back to the seventeenth century. 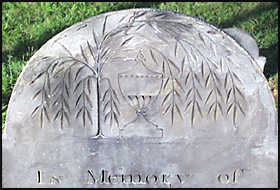 Their carvings exemplify artistic and religious expression of the Puritan period, and their epitaphs reflect the times of these settlers, sea captains, fishermen, wives and children. These pages may be navigated in several ways. To take the virtual tour, simply click the Next link at the bottom of each page. For direct access to specific pages, gravestones, or topics, go to the Site Map and make your selection. The graveyard has three public entrances. We begin this tour at the main entrance on Orne Street. A second entrance is nearby on Pond Street, and a third is on the other side of the hill by Redd’s Pond. Copyright © 1998-2007 by Jeff Kane. All rights reserved. Contact Jeff Kane at Ocean Song Web Design: www.oceansong.com.